In this post I’m going to make a side-by-side comparison of three pocket pistols; a vintage Iver Johnson revolver in .32 S&W, a Raven .25 auto-loader, and a Ruger LCP in .380. 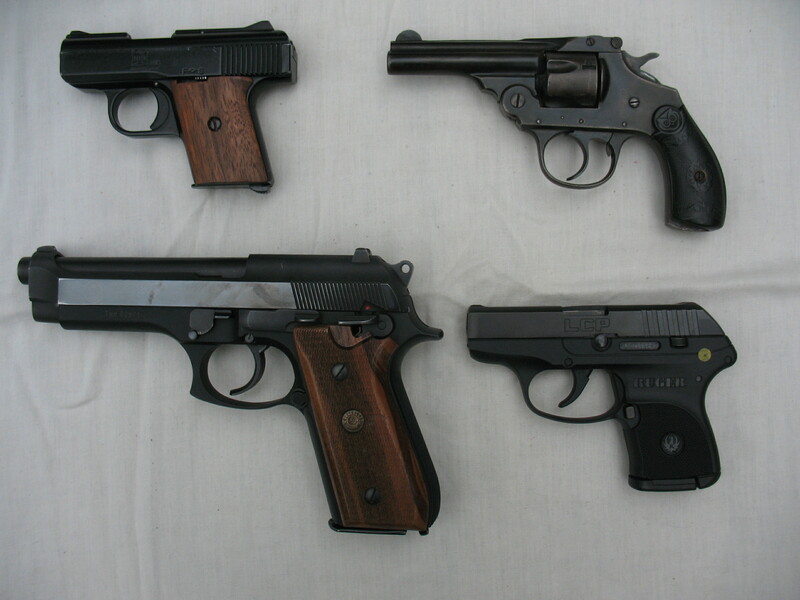 All of these firearms are very small in size, hence the term pocket pistol. Let me say from the start that I am no fan of pocket pistols. For home defense my choice is a shotgun. For a vehicle carry weapon my choice is a hand gun of at least 9mm with a long enough barrel to give a good sight plane. But with that being said, I can conceive of some instances where a pocket pistol might be called for. Many law enforcement officers carry a small pistol as a back-up weapon, and I can think of instances where a lady might like to have one in her purse, but in general I don’t think that there’s much place for these guns. Pictured below: on the top an Iver Johnson chambered for .32 S&W, bottom left a Raven .25 auto, and bottom right a Ruger LCP chambered for .380 auto. 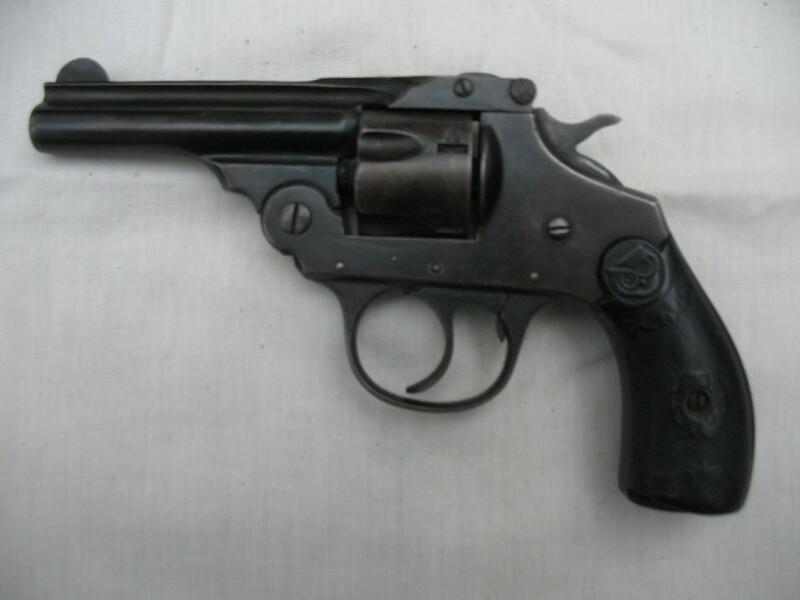 I see three main drawbacks to the pocket pistol: (1) they usually have a very short barrel and hence are very inaccurate over any distance, (2) they generally fire a fairly small caliber round (in Texas it is illegal to carry anything smaller than .380 as a concealed weapon), and (3) the workmanship on most (but not all) pocket pistols is generally pretty poor. Now, why would anyone carry a pocket pistol? Well, I think that the obvious answer is that they feel like they may need it to protect their life. So, if your life may depend on it, don’t you think that it makes sense to carry the most accurate and reliable pocket pistol that you can find? So let’s run these three pocket pistols through a few tests and see what the results are. We are going to do four tests. First we will test for accuracy by firing five rounds with aimed fire and with the first round already chambered. Since pocket pistols are intended for very short range use, we will do our shooting from twelve feet. We will then test for accuracy from the same range but this time we will start with the pistol loaded for safe carry, then ready the pistol and fire three rounds in five seconds. We will test for reliability by running three magazines of ammo through each pistol. And finally we will test for power by measuring the penetration of each round into a phone book from ten feet. The targets pictured below show the results of the slow, aimed fire test. On these targets the center bull is 10 points, the next ring out is 7 points, the next ring 5 points, and the outside ring is 3 points. The Ruger and the Raven fired comparable groups. Both had two in the 10 ring, two in the 7 ring out and one in the 5 ring. The Raven shot a little tighter group which was a real surprise to me. The Iver Johnson was only a little less accurate with one 10, three 7’s, and one 5. 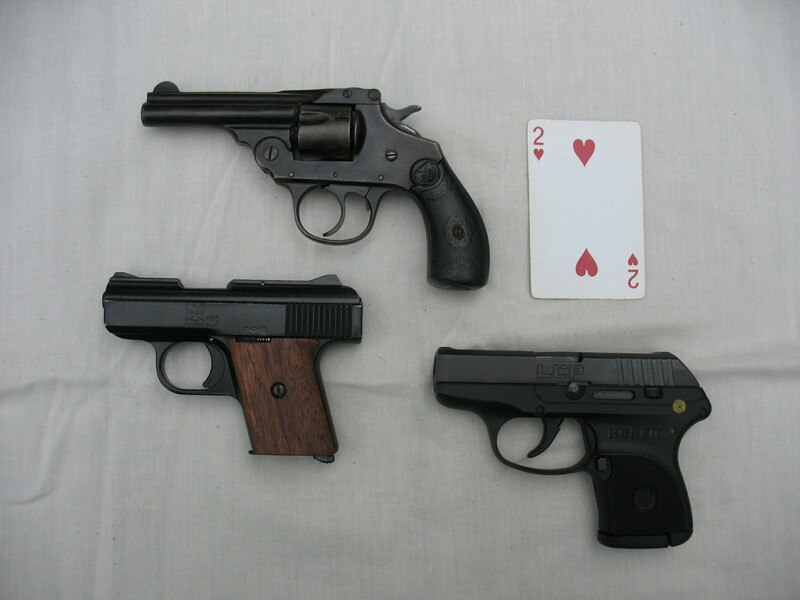 Safe carry is different on all three of these firearms. 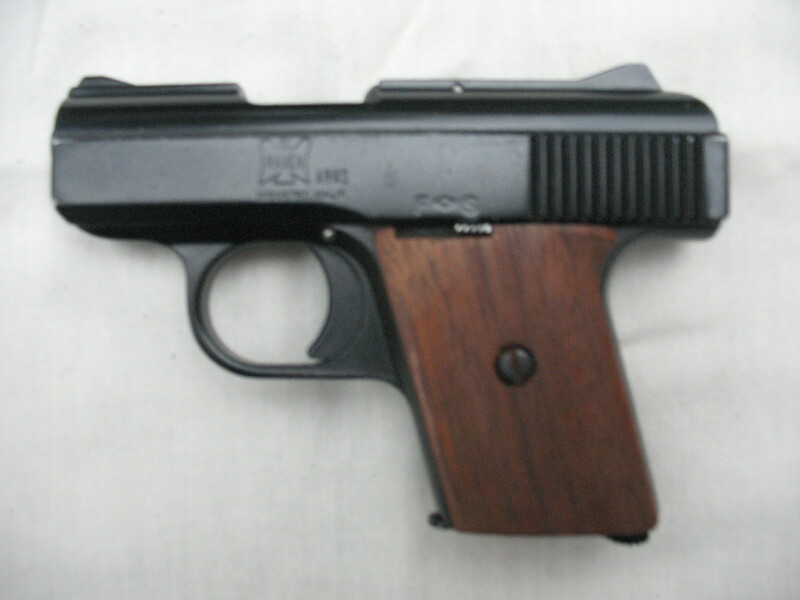 The Ruger holds six rounds in the magazine. It has no safety and always has the hammer down. Every shot is double action with this pistol, so it is safe to carry with a round in the chamber. But the long double action pull is a little disconcerting. I have to admit that it is a smooth pull, but it is just not what I expect to feel with an auto loader. The Raven holds six rounds in the magazine. It has a safety but I would only feel comfortable carrying it with an empty chamber. This means chambering a round before the first shot. Not something I would want to have to do in a hot situation. The Iver Johnson, being a revolver is probably safe to carry with the hammer down on a round, but I just can’t do this with a revolver. I always carry a revolver with the hammer down on an empty chamber. Just an old habit, but it is deeply ingrained in my shooting habits. Since the I J only holds five rounds, this is a severe limitation as far as fire power goes. An empty chamber under the hammer means that you only have four rounds to use. 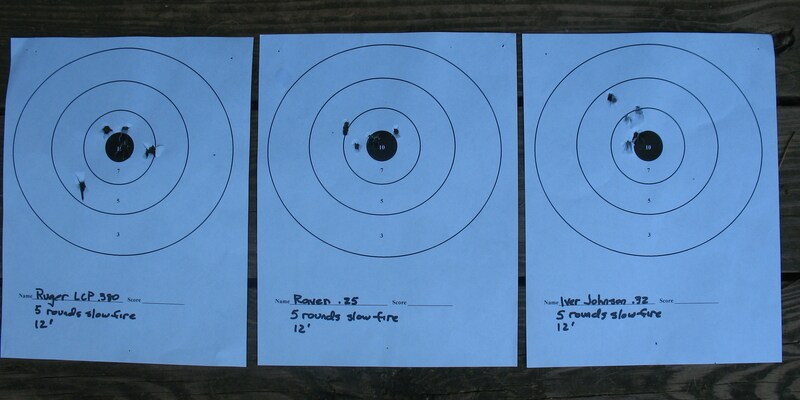 The Ruger and the Iver Johnson were virtually tied in this test. 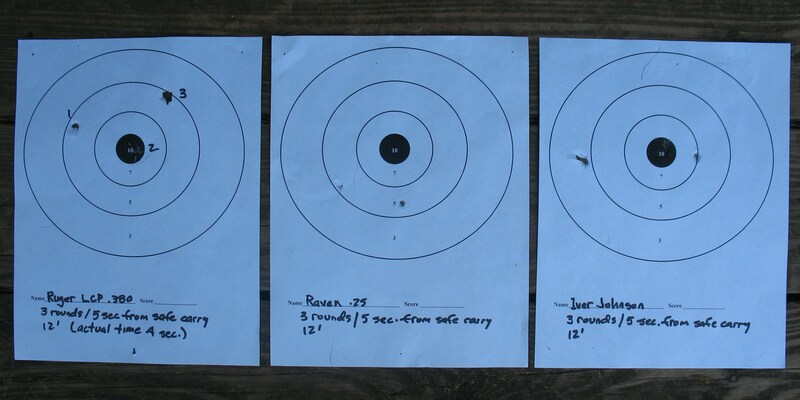 The Ruger shot a 10 and two fives for a total of 20 points. The Iver Johnson fired a 10, a 3, and a 7 for a total of 20 points. The Raven was out of it on this test, firing only two 5’s. Time expired before the third round could be fired. The problem was that the Raven put itself on safety after ejecting the second round. This occurred several times in the course of firing this weapon. I don’t know if it is just this particular gun or if this is a problem with Ravens in general, but it is a definite deal breaker if this firearm is intended for self defense. 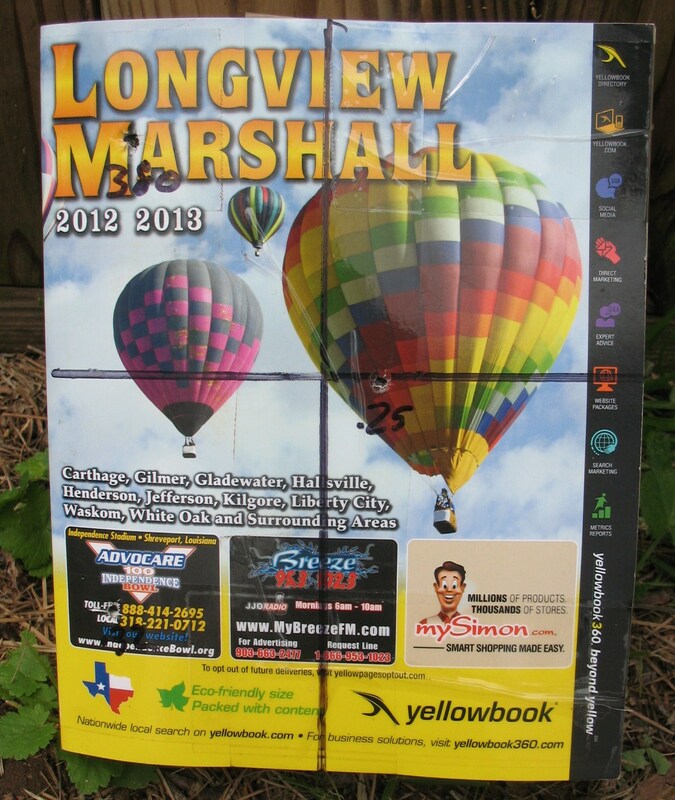 For this test we fired a round from each handgun into two telephone books that were taped together and counted the number of pages that each slug penetrated. Big surprise!! The Raven .25 had the best penetration. Not by much, but it did win this one. 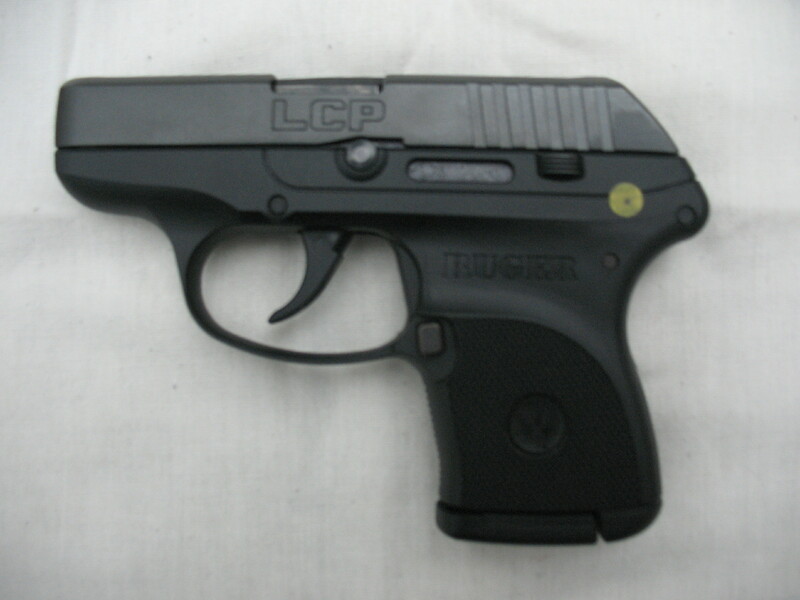 The Ruger .380 penetrated 1342 pages. The jacketed slug was slightly flattened on one side of the nose. Needless to say, the greater mass of this slug did more damage than the .25, and the friction generated by the larger slug is probably why there was a little less penetration than the smaller .25. The Raven .25 penetrated 1375 pages. Its jacketed slug was pristine. No expansion at all, and hence not as much damage. All I had for the Iver Johnson .32 were unjacketed rounds. It only penetrated 623 pages; less than half of the other two firearms. As you can see in the picture below, the slug was mashed in all along one side. The heavy, unjacketed slug sitting on top of a relatively light powder charge greatly reduced the penetration of this round; but, here again, shock would be much greater than the .25. 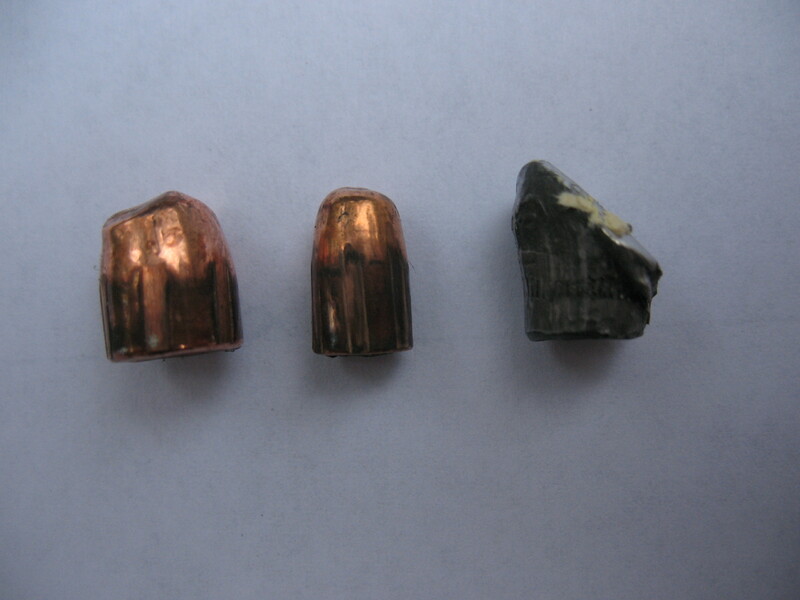 Pictured below: On the left is the .380 slug, .25 is in the center, and the .32 S&W on the right. The Ruger and the Iver Johnson had no problems cycling rounds. The Raven, on the other hand, put itself on safety two different times while we were running rounds through it. Not a good thing.